If you’ve been looking at expanded metal mesh you’ll already know that it comes in many shapes and sizes. To describe the variations and features of each mesh there are some technical terms that often get used. This can be handy if you’re in-the-know but the jargon can be a bit baffling to the newcomer. No need to worry! With a bit of extra knowledge you’ll get a much clearer picture of what you’re looking at, and the ability to find the perfect mesh. In this article we’ll give you a glossary of some of the most commonly used terminology. 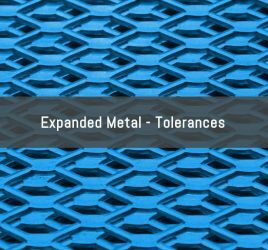 You might also like to check out our What is Expanded Metal and Expanded Metal Tolerances articles. The diamond shaped openings in expanded mesh are wider in one direction than the other and so they are normally described with the two measurements, one for the Long Way (LW) and one for the Short Way (SW). In any given sheet of mesh the diamonds will all be uniform over the sheet but they may run parallel to either the length or width of the sheet. Generally the dimensions of the sheet are quoted to correspond with the LW and SW mesh directions so for example a 1200 x 2400 sheet would have the Long Way of the diamond running parallel to the width of the sheet. If it was quoted 2400 x 1200 then the diamonds would run the opposite way. When a plain sheet of metal is slit and stretched to create expanded metal it comes out of the expander with the typical textured or stepped surface on each face. This regular expanded mesh is described as having a ‘raised’ surface. Some expanded mesh is then put through a secondary rolling process which flattens it out to create ‘flattened’ mesh. Flattened mesh has similar size and shape openings to the original but has been squashed flat so it’s thinner and has smooth faces. Strands are the individual ‘wires’ of metal that form the mesh. 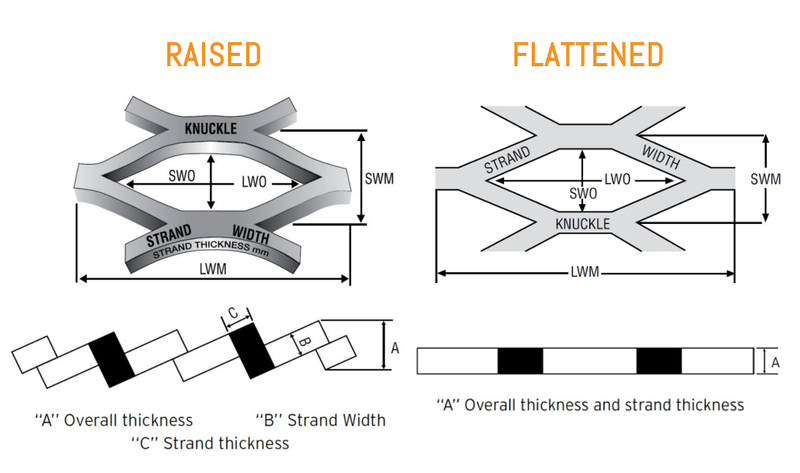 Strands typically have a rectangular cross-section and are described in terms of a Strand Width [B] and a Strand Thickness [C]. Mesh with wider and thicker strands is typically heavier and stronger. In a raised mesh the strand thickness corresponds to the thickness of the original sheet metal it was made from. The knuckle is the intersection of two strands and it is always the width of two strands. The measurement of the total thickness of the mesh [A], as measured at the knuckle. For raised mesh the overall thickness is always much thicker than the original metal it was made from. A complete expanded diamond with four strands joined at each knuckle. Signifies the number of continuous meshes (diamonds) in a straight line per metre, counted in the Short Way direction. The distance from a point on a knuckle to the corresponding point on the following knuckle, measured in the Long Way direction. This distance is also sometimes referred to as ‘pitch’ LWM. The distance from a point on a knuckle to the corresponding point on the following knuckle, measured in the Short Way direction. This distance is also sometimes referred to as ‘pitch’ SWM. The size of the openings in the mesh, as measured in the Long Way direction. Taken from the inside of one knuckle across to the inside of the opposite knuckle. The size of the openings in the mesh, as measured in the Short Way direction. Taken from the inside of one knuckle across to the inside of the opposite knuckle. The open area of a mesh is a calculated value that indicates what percentage of the surface area of the sheet is ‘open’. One way to think of this is the total area of all the holes (if you added them all up) quoted as a percentage of the total surface area of the sheet. The appropriate open area for a mesh will depend on what purpose the mesh is being used for and sometimes it is an important consideration and sometimes less so. For example, a ventilation grille might ideally have a high open area (70-80%) to allow a free flow of air through the mesh, whereas an industrial flooring product it might have quite a low open area (10-20%) as strength is the main priority. Due to the angular geometry of raised expanded metal the open area is often quoted as a range, which can be thought of as ‘low case’ and ‘high case’. The lower value has been calculated for a view at 90 degrees (normal) to the surface i.e. ‘straight on’ to the sheet, but at an angle to the openings. The higher open area number is if you view the sheets at an angle that is parallel with the strands so straight through the openings. For flattened meshes this effect is not present and the true open area can be calculated normal (90 degrees) to the surface as with other kinds of mesh like woven wire and perforated metal. A cutting operation carried out after expanding to trim expanded sheets to final size and tolerance. Guillotining or shearing may leave ‘Stags’ on a mesh. Stags are incomplete strands of mesh that exist beyond the joints of a mesh. They generally happen when the mesh has been trimmed and can happen in either the Long Way or Short Way direction. Care should be taken in handling sheets that have stag ends as they can often be sharp. A description for any bow which may be present in mesh sheet. Camber is measured by placing a straight edge along the concave side of the sheet parallel to Long Way, touching both ends of the sheet. The maximum distance between the edge of the expanded metal and the straight edge is the camber. Hot dip galvanising is a zinc coating process that can be applied to steel mesh to provide resistance to rusting. All hot dip galvanizing is carried out to Australian and New Zealand Standard AS/NZS4680:2006. If choosing smaller steel profiles be aware that some distortion and windowing of the expanded mesh may be present as a result of the galvanizing process. When steel mesh is hot dip galvanised a thin web of the zinc coating may extend into the diamond openings and fill them in slightly, this is often seen in the corners. On small mesh sizes (up to 15 profile), and flattened mesh this effect is much more likely and on occasion the holes may be blanked over completely, this is known as windowing. 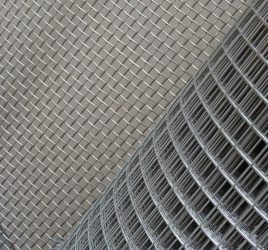 The tolerances of expanded metal determine allowable variation from the norm in any dimensions, or other property of the mesh for it to be acceptable for sale. Expanded mesh has tolerances for overall dimensions as well as camber, out of square, strand size and weight. Meshstore Western Australia stocks a wide range of expanded aluminium mesh and expanded steel mesh sheets for purchase online.